Lyle: One of the big questions I get from guitar students is “How do I know what key I'm in and what scales should I use”? 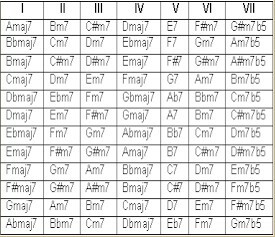 If you know how to analyze the chord progression you'll be able to see how each chord relates to each other. What you need to know is the resulting chords of the harmonized major scale. Lyle: Here we take a C major scale, stack it on itself at the interval of a third (starting on 'e'), again at the interval of a fifth (starting on 'g'), and again at the seventh (starting on 'b'), and the result is a harmonized scale in the key of C.
Lyle: Notice that the II and II minor chords are a whole step apart. Notice that the IV and V are a whole step apart. Things like this will help you analyze a chord progression quickly. Through the process of elimination, you'll be able to come up with the key center of the chords being played. Lyle: This formula works for ANY harmonized major scale. Lyle: If you saw a chord progression of C - Dm - Em - Dm, this would have to be the I, II, III, II chords related to the key of C.
Lyle: This means you could play the C major scale and any of the modes for the key of C against this chord progression. Lyle: Play a C major scale against this jam track that uses these chords and you'll hear how everything blends and harmonizes together. Lyle: If you saw a chord progression of Am, Dm, and Em, you would be looking at the VI, II, III chords in the key of C.
Lyle: If you saw a chord progression of G - F - C, you would have the V - IV - I in the key of C.
Lyle: Look at the chart above. Note that a Major 7 chord is related to a Major chord, and a Minor 7 is related to a Minor chord. The only position that holds the dominant 7 chord is the V position. Lyle: If you had a chord progression of G7 only, what major key is this chord related to and what major scale could you play over it? Lyle: The G7 chord is the V chord in the key of C major. You could play the C major scale over the G7 chord. Lyle: If you had a chord progression of Am and Bm, what key is that in and what major scale could you play over it? Lyle: And why are you picking G? Lyle: If you had a chord progression of Bm7, E7, what key is that in and what major scale could you play over it? Lyle: A is the right answer! Bm7 is the II, E7 is the V, both in the key of A.
Lyle: This means you could play the A major scale over this progression and any of the modes in the key of A.
BigTX: Could you play a A pent? Lyle: No, you would probably want to play the A Major pentatonic because you're in the key of A Major. Lyle: F# Minor pentatonic yes. floydwhammy: You mean you can play A Ionian, B Dorian, C Phrygian etc., right not A Dorian, A Phrygian, A Lydian etc.? Lyle: Not all chord progressions stay in the same key. Lyle: If you had a chord progression of A7 to D7, you would technically be switching to two different keys becasue these are both dominant chords. Only one dominant chord is found in each key. Lyle: A7 is the V in D Major, D7 is the V in G Major. BigTX: A7 and D7 progressions are the heart of blues? Lyle: Dominant chords are used in Blues style all the time. erlon: so A mixolydian then A dorian? Lyle: Nice one erlon, that is right! Lyle: Understand that in ANY key, there are chords that relate to it. Lyle: By the huge process of elimination, you come up with what key you're in. BigTX: the 7 confuse me. is that it could be a 7th chord? Lyle: There are Major 7 chords, there are Minor 7 chords, there are Dominant 7 chords. Lyle: There is also the VII chord, which is refering to the VII degree of the Major scale. BigTX: cool, I get the jist of it. Lyle: Welcome, hope this helps.